There was no important game on the Hofstra Pride men’s lacrosse schedule than Friday’s matchup against the Stags of Fairfield University. The season and a spot in CAA post-season play was on the line at Rafferty Stadium for the Pride. Unfortunately, the winds weren’t blowing in Hofstra’s favor as a late run in the fourth period wasn’t enough and the season ended in a bitter 5-4 defeat. The disappointment of the loss was evident in Coach Seth Tierney’s voice during post-game interview. The Stags did exactly what the Dragons of Drexel, Minutemen of UMass, and Big Red of Cornell did to defeat Hofstra: they got out to an early lead in the first period. Tristan Sperry got the scoring for the Stags started with a goal, his twentieth of the season, two minutes into the game to give the Stags a 1-0 lead. Jake Knostman extended the lead to 2-0 with his sixteenth goal of the season four minutes later. TJ Neubauer, Joe Rodrigues, and Dave Fleming all contributed goals in the first period as well to end the first period with a commanding 5-0 lead for Fairfield. The second period belonged to Hofstra as it was their turn to go on the offensive. Brian von Bargen put the Pride on the scoreboard just a minute fifty-five seconds in. He would score for the second time in the game a little over four minutes later to cut the lead to three goals. There has never been a game this season when Sam Llinares didn’t have his name in the stat sheet, and this game was no exception as he scored his 33rd goal of the season to bring the score at the end of the half to 5-3. Neither team could score in the third period so it was onto the fourth. 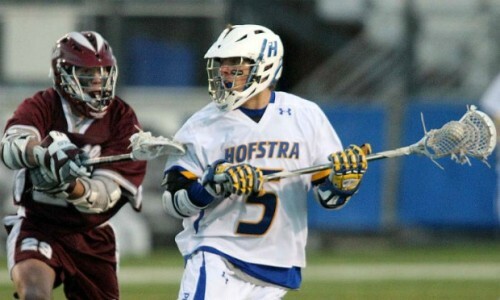 If Hofstra was going to complete their comeback, they would need to do it in the fourth. With under three minutes to go in the game, Zachary Franco shot the ball into the net to bring the Pride to within one. Under third seconds to go, the Pride found them scrambling to get a sht into the net and force overtime. Llinares shot the ball wide but senior Mike Malave was able to get the ball back. With seven seconds to go, Malave tried to be the hero for Hofstra, but his shot went just above the goal and officially ended the season for him and the Pride. With this loss, the Pride officially close put their 2015 season at 5-9 overall and 2-3 in CAA play. This season marked the third time the Pride failed to make the CAA semi-finals in the last four seasons and also the second time the Pride had finished with a losing record since 2012. As for the Fairfield Stags, they improve to 9-5 on the season and 4-1 in CAA play, clinching them share of the CAA title for the regular season. They will wait to see who they will play in the CAA semi-finals on Thursday. Despite the disappointment of the season being over, the Pride have some good news for its program. Sophomore defender Joe Ferriso, who passed away prior to the 2015 lacrosse season, was named as one of the five finalists for the One Love Foundation’s Yeardley Reynolds Love Unsung Hero Award. This award recognizes two individuals, one man and one woman, for their dedication, integrity, humility, hard work, community service, leadership, kindness and sportsmanship, all qualities exemplified by UVA’s Yeardley Love who passed away in 2010. He was named along with Todd Stewart from Brown University, Geoffrey Sullivan from Colgate University, Patrick Frazier from Loyola University, and Kyle Zittel from Penn State University.